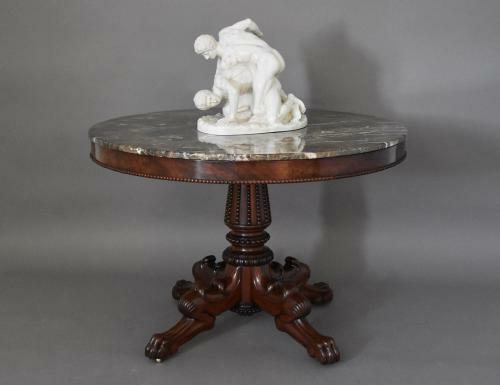 This table consists of a circular brown and cream veined marble top (not original) leading down to a fine quality mahogany veneered frieze (applied to an oak frame) with ball bead moulding. This leads down to a turned and tapered central column with applied ball bead moulding, a ball bead collar, egg and dart moulding and also under the column to the bottom a further ball bead decoration. The quatre-form base is finely carved in the typical French Empire style consisting of four superbly carved legs with carved shell decoration, terminating with carved paw feet and supported on original brass castors. These types of table usually have a tri-form base of the same design, this has four legs (quatre-form base) instead of three which makes this table unusual, this is probably due to the size and therefore providing more stability for the table.